Courtesy Democratic candidates for state and federal office, new and incumbent, meet with tribal members of the Tohono O’odham Nation to talk about issues that affect the tribe. When President Trump was elected almost two years ago, a wave of uncertainty overcame the Tohono O'odham Nation. The president's push to build a border wall meant that the tribe's way of life was at stake, so a few members decided that now was the time to change the status quo. They formed Indivisible Tohono, a grassroots organization that creates opportunities for tribal members to speak with their representatives about issues that are unique to them, become civically engaged and learn about Arizona's legislation and how it affects them. "We are historically disenfranchised; we've only had the right to vote since 1948, and we have a low voter turnout so we're trying to change that," said Gabriella Cazares-Kelly, a tribal member and co-founder of Indivisible Tohono. "We're trying to get people voting and understand all of the political positions that affect our community." The group originally started by engaging Sens. Jeff Flake and John McCain to take a stance against the border wall, but as events transpired in the world of politics, their efforts quickly grew into a local coalition that has one main goal: refusing to let the issues Native Americans face go unaddressed. In the past, the Tohono O'odham Nation has been largely left out of decisions made at the state capitol. April Ignacio, another tribal member and co-founder of Indivisible Tohono, believes they are forgotten because Arizona's elected officials aren't engaged with the majority of the tribal community and vice versa. She said that because there hasn't been much dialogue, the tribe and the consequences that new laws may have on them becomes an afterthought to those in power. 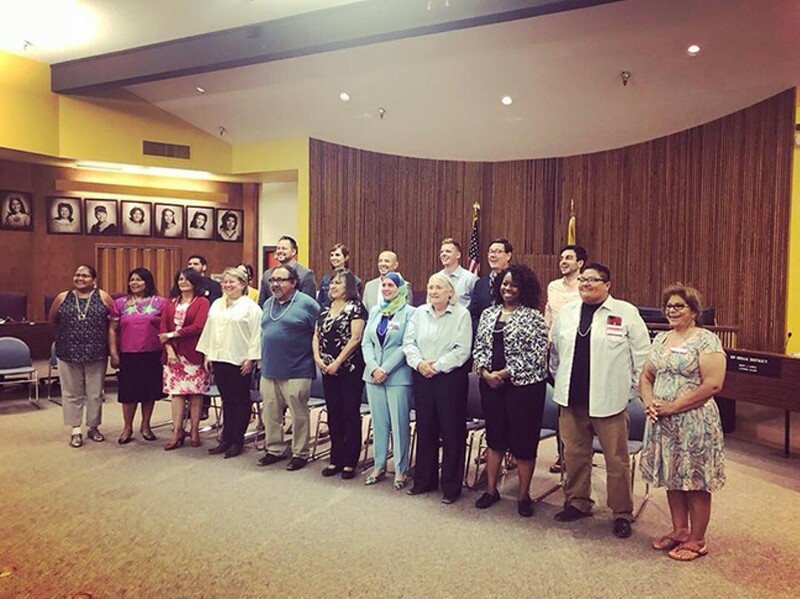 On Friday, June 29, the organizers of Indivisible Tohono gathered 19 Democratic candidates for state and federal office and almost 100 tribal members in the Tohono O'odham legislative chambers to start that dialogue. "This is the first time that we know of in our political history that candidates are coming to campaign on the Nation as opposed to showing up at a rodeo and riding on a float during our parade," Ignacio said before the event. "It's a lot more intimate, and it actually allows O'odham tribal members to meet these individuals who say they want to represent us." Each candidate had two minutes to introduce themselves and briefly describe their platform. Kathy Hoffman, who's running for Superintendent of Public Instruction, told the crowd that the Department of Education should take more responsibility in preserving the languages of this region. She believes that there should be more bilingual schools in Arizona. Gubernatorial candidate Kelly Fryer said if elected, she will make sure to treat all 22 tribes as sovereign and self-sufficient nations. She promised to restore Arizona's Commission of Indian Affairs and make sure that every board under her supervision reflects the diversity of the population. Sara Mae Williams, a Green Party candidate for State Representative in LD4 and member of the Tohono O'odham Nation, said that now is the time to tell their story. She said that the nation has been forced to do a lot with less and that as a community they deserve better from their elected officials. After the candidates had a chance to speak, Indivisible Tohono served up food and gave tribal members an opportunity to mingle with the candidates and tell them about their specific concerns and issues. "One of the big things that came up was the border wall, but also the militarization of our community," Cazares-Kelly said. "We're really concerned about unchecked militarized agents who are terrorizing our community members." She referenced an example from just three weeks ago, when a uniformed Border Patrol agent intentionally hit a man with his marked vehicle on the Tohono O'odham reservation and then drove away. "People were concerned about whether we were going to be the next Standing Rock because of the border wall," she added. Access to water, preservation of the environment and animals in the border region, the high rate of domestic violence in the community and quality education on the reservation are all concerns that Indivisible Tohono is trying to make visible. There were board members from the Tohono O'odham Department of Education present at the candidate event, as well as a principal and several teachers. Cazares-Kelly said that there is an Office of Indian Education in Arizona, but they have only one employee for the entire office. "A lot of times what happens is when those local issues or those local concerns come up on a state level, there's not a representative at the table," Ignacio said. "We want to change that. Especially with developing this relationship with these candidates, so they know who they're representing, they know who they're talking about." The organizers said they were uncertain about how this unprecedented event would be received. They didn't know how many Tohono O'odham members would be interested in coming to speak with candidates, and they didn't know how many candidates would be interested in speaking to the members, since politicians have generally interacted with the tribal government exclusively. "But I think that a lot of the candidates are running on not just the idea of getting votes but building relationships," Cazares-Kelly said. According to Cazarez-Kelly, the nation has been generally scared, uninformed and unsure of what to expect for the future, so they decided to educate themselves. Indivisible Tohono previously hosted a forum with tribal members, government officials and lawyers to learn how the political and legal systems works and what they can do to make their voices heard. "We realized that people were hungry for this knowledge and information we needed," she said. Cazares-Kelly, Ignacio and the rest of the Indivisible Tohono team are already working on their next project. Before the primaries arrive on Aug. 28, the organization will be focused on getting more O'odham members registered to vote. The main reservation has a population of over 10,000 people with only 3,240 registered voters, according to the Pima County Recorder's Office. "One of the major things that we're trying to do is make space for ourselves in places where there doesn't seem to be space for us," Cazares-Kelly said. "We've been working on that, and we're very appreciative of those who are understanding and are participating in the growth of a politically active community."